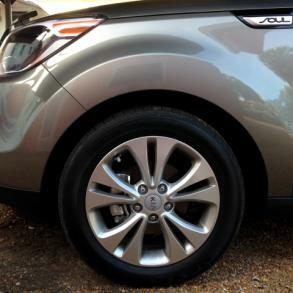 I have 4 "like NEW" condition 17 inch x 7 inch alloy wheels with a 5x114.3 bolt pattern that were on a 2014 Kia Soul Plus. I am selling as a set of 4 at the price of $350.00 plus $50. shipping. These are WHEELS ONLY, NO TIRES. These will fit any Kia Soul and other cars with a 5x114.3 bolt pattern with 215/55R17 tires.